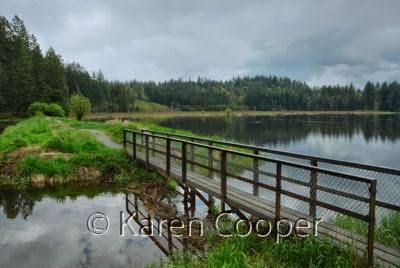 Minnekhada Park is situated in north east Coquitlam, and has several km's of fairly easy hiking trails. Easy if you never had that third helping of turkey and cranberries last Christmas, that is. There's quite a large marsh area with lots of ducks and geese, frogs and even a wee snake or two. Less than a foot long is wee, anything bigger than a foot is huge. That's just the way it is in life. I live with the facts. There is an old hunting lodge that you can visit if you get tired of the fresh air. I didn't go in the lodge, I needed the smell of pine trees and rain on the forest floor to renew my inner self. And wear off some of that chocolate from the last choc-splurge I had. Life is worth living with chocolate in it. I tried to come here on a week-end. It was packed. During a week-day I ran across 2 other people in the whole park. And a hummingbird that owned the path I was trying to walk on. Well, after all, he was here first. I don't have a problem with that. I can share with the wild critters. Nice blog! I love all of your photos - this area looks like one of the prettiest places around! Great pics. Better than the Dubai snowdome!